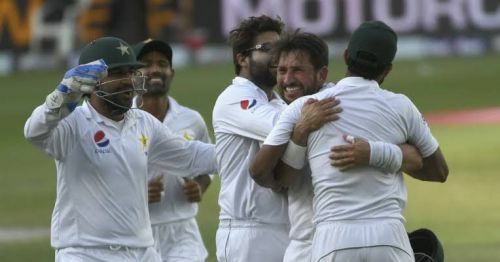 Pakistan countered the Kiwis in the second Test by an innings and 16 runs to level the series. Now both teams will look to 3nd the tour on a high, when they head back to Sheikh Zayed Stadium in Abu Dhabi for the third and final Test from Monday, December 3. Both teams have now faced each other in 57 Test matches with the Asians leading the scoreline 25-11. The other 21 matches have ended in draws. In the five matches played in UAE, the scoreline is tied at 2-2, with one ending in a stalemate. After the opening Test blunder, the hosts made sure that there were no unnecessary hiccups in the second Test. They will now come into this decisive one as a more confident side and will begin as favorites to clinch series. Babar Azam is currently leading the runs charts in the series with 202 runs. He scored an unbeaten 127 in the previous game. Harris Sohail played a steady knock of 147 runs from 421 balls and these two along with Azhar Ali will be expected to carry their good form into the final Test. Except these three they will also need strong contributions from their openers Imam ul Haq and Mohammad Hafeez to lay down a strong opening stand for the others to follow. Yasir Shah will once again pose a major threat to the Kiwi lineup. The leg-spinner has been their leading wicket-taker with 22 wickets, which includes an impressive 14 wickets haul at Dubai. While Hasan Ali took a five-fer at this ground in the first test and these two are expected to be their strike bowlers in the final Test. to replicate first test heroics. New Zealand performance on this tour overall has not been consistent and their poor batting and bowling display in the first innings of the second Test laid down the foundation for an innings defeat. However, the Kiwis will take heart from their win in the first Test at Abu Dhabi and will look to avoid another series loss to the Men in Green. Skipper Kane Williamson has been their most consistent batsman of the series and scored 100 and 58 runs in two Tests respectively. While Opener Tom Latham is coming off a 50 in last game and these two along with Jeet Raval forms a formidable top order and will once again hold the key for Kiwis in the decisive encounter. Ross Taylor and Henry Nicholas bounced back in second innings with respective scores of 82 and 77 in second innings and they will be eager to replicate it in the third Test. Colin de Grandhomme was sole performer for New Zealand in the second Test with two wickets, while Trent Boult and Ajaz Patel were key performers in the first Test with four and seven wickets respectively and these three will be backed by skipper to put their best foot forward and crack few early scalps. Ish Sodhi and Neil Wagner would be expected to chip in with important wickets in the match. The duo failed miserably in the second Test and would be eager to rectify their performance in the third match.